Cooking with Kimberly: The "eyes" have it. Potato eyes that is. 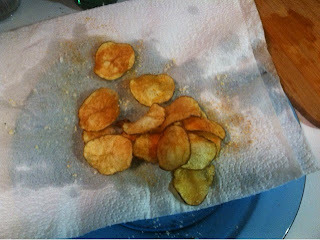 Or make your own potato crisps. Slice the potatoes thinly. 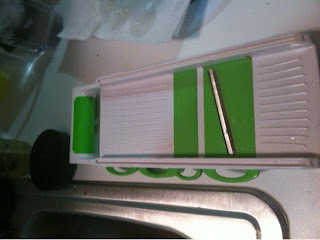 Use a madaline or slicer. Don't make them any more than about 1/8 inch. Add the salt to the bowl of water. 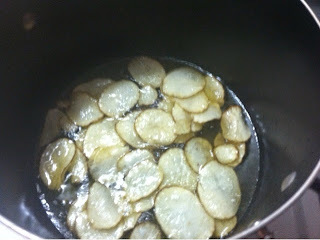 As the potatoes are sliced add them to the salted water. Let them sit for a least 15 minutes. Drain and dry on paper towls. Get them as dry as possible. Wate and hot oil don't mix. Meanwhile heat the oil in a large stock pot. Make sure it's at least 350 before adding the potatoes. Cook about 10 minutes on medium heat. When the slices are golden transfer to paper towls to drain. Add your favorite seasonings . Cool and enjoy.